Air humidity too low? This is how you solve it! By nature many of the palms that we cultivate originate from tropical or subtropical areas. In terms of average temperature, a living room meets the requirements perfectly. Air humidity is often a much greater problem. In this article we discuss how this problem can be tackled easily. The central heating in the living room not only ensures the ideal temperature for you and your exotic plants, but also provides a very dry air. The fact that this was different before the time of central heating systems is proved by the fact that very different houseplants were kept at the time. Nowadays, a fern or ivy in the living room is no longer that common anymore. It is therefore recommended that you pay extra attention to the location and/or use of the heating radiator. Underfloor heating is a nice alternative. Not only is the heating (and thus also the dry air) much less concentrated on certain places but the warm underground also stimulates the growth of the roots. Spraying the leaves of your palm regularly with a humidifier is of course a possibility. It’s natural, it removes dust on the leaves and creates a good opportunity to take a closer look at the overall condition of your palm. Unfortunately, there are also some disadvantages. 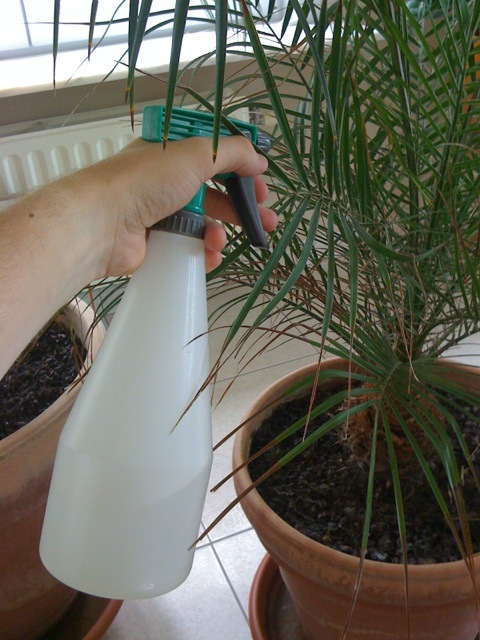 Spraying is usually accompanied by the necessary cleaning of your floor afterwards and the palm drips for a while. The effect is also only of short duration because the mist dries up relatively quickly. Spraying repeatedly is therefore a must. Especially in the case of palm trees from a very tropical climate such as the coconut palm. Another simple but perhaps less aesthetic solution is to place water bowls. The water evaporates and increases humidity locally. You can increase humidity where necessary in a targeted manner. Special trays are sold to hang on the radiator itself, but a own creation will do just as good. A plastic bottle can be cut along the length of the bottle. Place it filled with water on the radiator. You can also put a bowl of water on the potting ground or next to it. The only thing you have to do now is to fill up all the water bowls regularly. The most discreet and durable technique for increasing the humidity of the air, where necessary, is so-called island method. 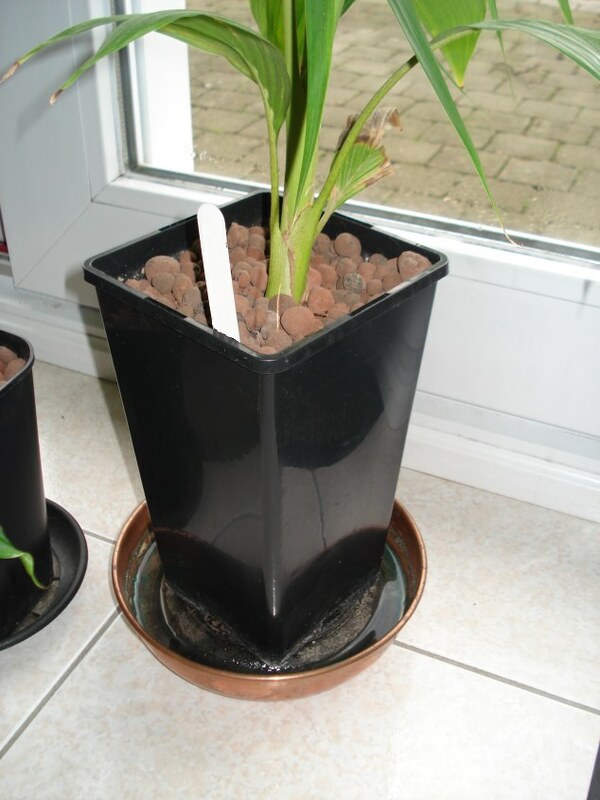 The intention is that there will be permanent water in the saucer without the palm being permanently standing in the water because this would cause root rot. It is therefore important that the pot is placed on an elevation to avoid direct contact with the water. For this you can use anything; an inverted smaller saucer (from which the name “island method”), bobbins, stones, gravel,….. The water from the saucer evaporates up along the pot and thus ensures a locally increased humidity. When watering the palm, the excess water runs through the drainage holes in the saucer below it, so that there is always a layer of water in it. If necessary, you can also fill it directly. Outside, humidity is absolutely no problem. It rains often enough so we have about the same humidity as in a tropical climate….